The influence of energy on geopolitics has historically referred to the influence of fossil fuels – coal, oil and natural gas. However, renewable energy sources are fast becoming a feasible alternative to fossil fuels, both economically and as a long-term sustainable solution to tackle climate change. 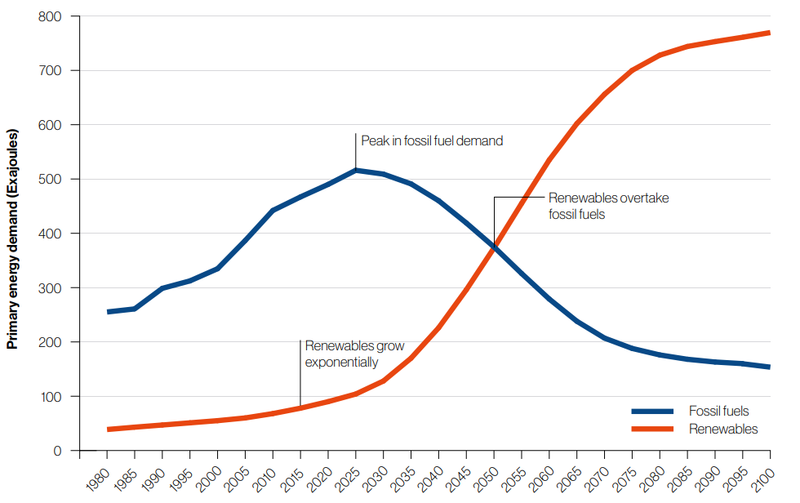 Backcasting scenarios produced by the IEA and IRENA predict renewables making up 50-70% of the global energy mix by 2050. It is very difficult to predict what the future will hold, but it is clear that as the global energy industry transitions to centre around renewable sources such as wind, solar and geothermal energy, there will be huge ramifications for global geopolitics. Recent geopolitical manoeuvrings highlight the value of fossil fuels to nations, which can cause tensions between nations to simmer and even spark into outright war. One such example is the Russian annexation of Crimea in 2014. Russia supplies 30% of European gas and has heavy economic reliance on gas sales to Europe – the idea of the EU gaining greater control over this gas supply was anathema. Additionally, by taking control of Crimea, the Russian government could now lay claim to potential new offshore sources of oil and gas in the Black Sea. China’s construction projects on tiny islands in the South China Sea have angered neighbouring nations such as Vietnam and Malaysia who also claim the oil and gas beneath the atolls. South Sudan has been mired in conflict since its formation, in part over control of key oil fields in the south of the country. Similar flashpoints exist in Nigeria and the Middle East. In a future where a nation’s economy, security and power are less reliant on fossil fuels, energy geopolitics will be quite different. If all countries are able to produce enough energy from renewable sources to meet their needs, a possible prediction is that the planet will become more peaceful, the global energy transition producing a ‘peace dividend’. This idea is worth examining in closer detail, to understand if such a future is a realistic prediction. The distribution of fossil fuels is not even – they are concentrated in certain spots and must be transported to other countries by pipeline or tanker. Countries with large amounts of energy resources hold a stronger position geopolitically and can leverage economic and political influence. Ref: U.S. Energy Information Administration (EIA). Map of daily transit volumes through world oil transit chokepoints. Estimates in mn barrels per day. Includes crude oil and petroleum liquids. Based on 2016 data. Fossil fuels can be stockpiled for security, and countries can apply embargoes against enemies or use fossil fuels to ensure allegiances. Trade alliances such as OPEC have formed as a result; de facto leader Saudi Arabia has recently opted to cut prices to maintain market share, especially in the face of competition from the US shale revolution. Additionally, other states may control crucial trade chokepoints that are necessary for the transport of fossil fuels. While energy resources provide huge power and wealth, states can also be subject to a ‘fossil fuel curse’. Ideally, sensible leaders invest the dividend from fossil fuels into sustainable development, but in reality, money from fossil fuels is often squandered or lost to corruption. Violent conflicts for control are common, and authoritarian regimes are more likely to take root in a country with lots of fossil fuels, using energy supplies to control or placate the population. An economy heavily reliant on export of one specific resource is exposed to sudden price shocks and runaway inflation. Often, other sections of the economy are underdeveloped due to overreliance on fossil fuels which provides the state with all its legitimacy and power. As fossil fuels diminish in importance, countries may be left with expensive ‘stranded assets’ – this refers to the network of oil wells, powers stations, refineries and so on which will need to be decommissioned. Examples of countries potentially ‘cursed’ by fossil fuels include Kuwait, Iraq, South Sudan and Nigeria. Using renewable energy will decentralise the energy grid – while fossil fuels are concentrated in certain spots, many different areas can produce renewable energy. The means of energy production are more diverse too, including solar, wind, hydroelectric, geothermal or biofuels. The renewable transition is likely to reduce the number of countries with an ‘oil curse’, however they may be replaced by countries with a ‘mineral curse’. Specific minerals such as cobalt, lithium and rare earth elements (REEs) are essential for producing renewable energy infrastructure (solar panels, wind turbines etc). Lithium production is currently led by Australia, Chile and China, and around 60% of the world’s cobalt is mined in the DRC by a few dominant energy companies, often using child labour. REEs are expensive and polluting to mine and the global market is currently dominated by China. It is feasible that these countries will suffer higher risks of violence, an imbalanced economy and high corruption due to the new ‘mineral curse’. Meanwhile, current oil and gas producers will feel the strain of losing a significant chunk of national revenue, which could cause political instability. A power vacuum can completely destabilise a country, especially one with high levels of unemployment. This was seen in the 1980s, when a drop in oil prices contributed to the break-up of the USSR. If the state can no longer provide subsidised fuel and energy, the government may lose any legitimacy and control. Governments may choose to focus on controlling infrastructure, such as major power lines and interconnectors. Transit countries will still have influence, regardless of the type of resource being transported and supplied. It is also possible that energy statecraft will alter from using oil and gas for leverage to using electricity for leverage. If national power grids are connected to form regional super-grids, one country may threaten to cut off supply to another member of the super-grid as a foreign policy tool. The increasing digitalisation of the energy network, such as the introduction of smart-meters and feed-in tariffs, also increases cybersecurity risk. Hostile countries may hack into computers controlling utilities and grids, shutting off supply to sections of the population. The Paris Agreement, signed by 195 countries in 2016, agreed to “limit the increase in global average temperature to well below 2 °C above pre-industrial levels”. Unchecked, the climate will warm significantly, and the frequency of extreme weather events will increase. Resource scarcity, natural disasters and increased migration may all follow, increasing political instability and the potential for conflict. Unless CCUS technology is developed that can remove carbon dioxide from the atmosphere on a large scale, ending reliance on fossil fuels and ensuring that renewables make up the majority of the global energy mix is the only sure-fire method of mitigating climate change and the instability it will bring. The diverse and varied nature of renewable energy sources will likely eradicate the established geopolitical relationship between supplier (exporter) states and importer states. Most countries have enough space and suitable geography to produce renewable energy, which will strengthen their energy security and independence. A good example is Iceland, which switched from importing oil and coal to using geothermal energy and hydroelectric power. By gaining energy independence, Iceland was able to save money on import tariffs, develop new industry in the country and widen its economic base. While job losses in traditional fossil fuel industries are inevitable, the complex and varied nature of renewable energy technology will generate new skilled jobs in the mining, construction, engineering and design sectors. Within each state, distributed renewable energy generation may decentralise the national power grid. If any resident or small business with a wind turbine or some solar panels can generate electricity for the grid, they will shift from being solely consumers to ‘prosumers’, influencing both supply and demand. This may weaken the grip of government or regional authorities, who will no longer be the sole suppliers of energy. As mentioned, focus may shift to controlling and maintaining infrastructure – neighbouring states will be incentivised to link up their national power grids to form regional ‘supergrids’, allowing governments to provide continuous supply despite the intermittent nature of renewable generation. This interdependence will also make conflict between these countries less desirable. Currently, approximately 1 billion people have no access to electricity and 3 billion do not have access to clean cooking. The advent of small-scale renewable generation can provide energy for new communities in impoverished areas, forming ‘mini-grids’ not connected to a national supply. President of the Energy Institute Malcolm Brinded describes how a “quiet revolution has been taking place [in East Africa]… with the installation of solar home systems designed for people living off-grid and on $4–30/d”. This challenges the traditional hub-and-spoke model and could help to lift households out of poverty, improving sustainable development and access to healthcare and education. States with renewable technology and key minerals look set to gain an advantage on the world stage, as states with high fossil fuel exports look set to lose out. A world dominated by renewables will likely be more stable and peaceful, but the geopolitical path to reach this point is complex and unknown. Ref: IRENA New World Report 2018, impact of energy transition on selected groupings and countries. 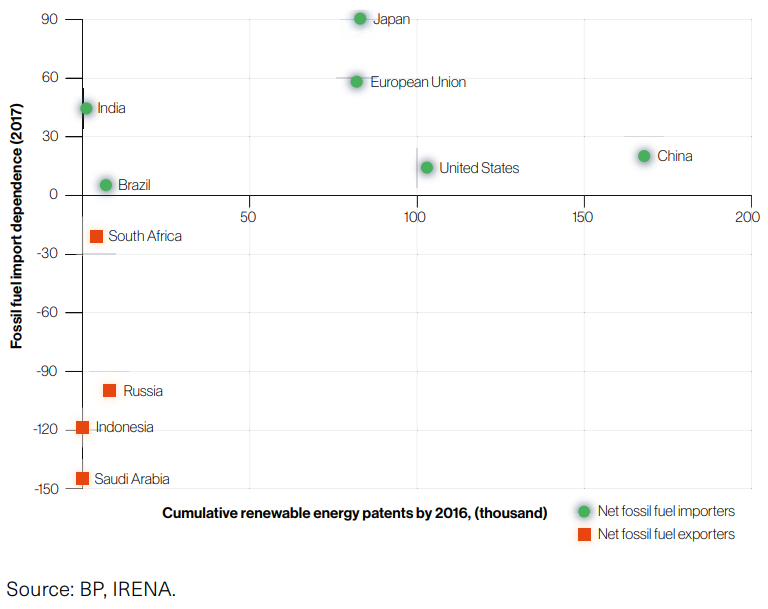 Based on data from BP and IRENA. Geopolitics refers to the influence of geography of nations on their power and international influence; this includes location and demographics, but also natural resources, energy supplies and energy security. - The geopolitics of renewable energy: Debunking four emerging myths, Indra Overland, Energy Research & Social Science, Vol. 49, March 2019, pp. 36-40.